Data can help us understand what people want—and how to reach them. The key is knowing which signals to listen to. 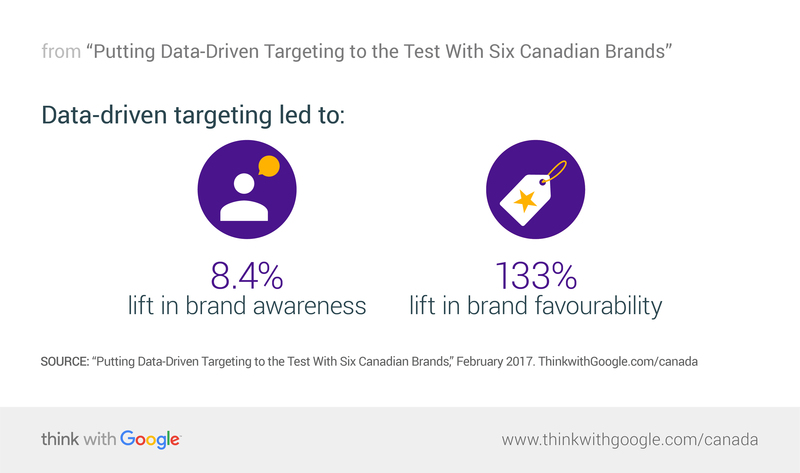 Here we have results from tests that determined whether advanced data-driven targeting improved brand and conversion metrics for six Canadian brands. The short version: It did. Today we're closer than ever to the holy grail of delivering the right messages to the right people at the right time. What may have sounded like a pipe dream years ago is more possible now thanks to data signals that give us a good idea of what people are looking for and what context they're in in their intent-rich micro-moments. 1. Data-driven targeting: affinity and in-market audiences, reaching people interested in products and services like those your business offers. 2. Non-data-driven targeting: demographics, geography, and context, reaching people based on who or where they are, or what content they’re looking at. We determined the effectiveness of each approach by measuring upper-funnel metrics like brand awareness and mid-funnel metrics like conversion assists. Here's what we found. We measured the difference in uplift between the two groups compared to the control group, and the results were in clear in favour of the affinity and in-market audience targeting. There was an 8.4% lift in brand awareness and a 133% lift in brand favourability among the data-driven targeted groups. Now onto mid-funnel metrics. 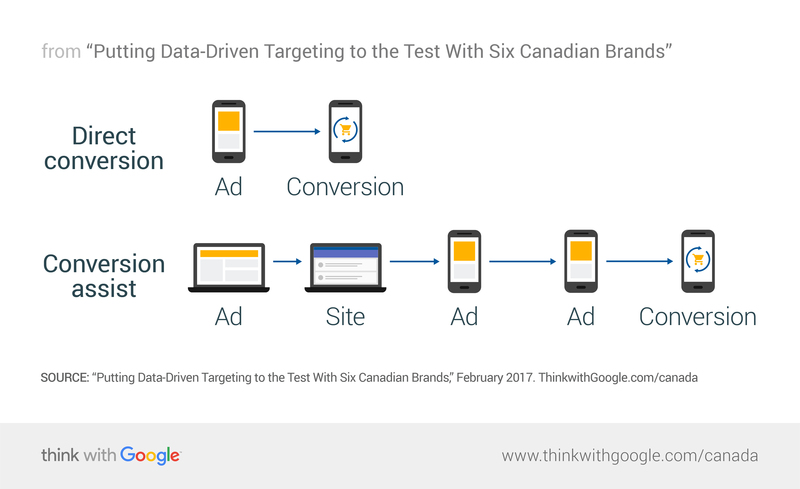 Many clients we work with at Google Marketing Platform1 have moved away from last-click conversion as a key metric and instead take a more holistic approach to measuring how advertising influences consumers all along the path to purchase. With that in mind, we set out to measure what we call “conversion assists” in our experiment. Conversion assists are ads that don't directly lead to a conversion but are served to consumers who eventually go on to convert. In other words, they're like the point guard who makes the perfect pass to the power forward who scores the basket. No assist, no two points—and no conversion. 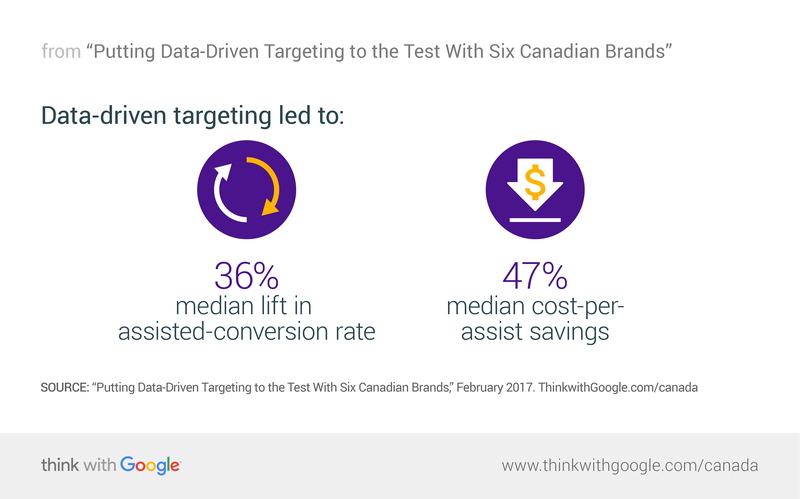 To measure the influence of data-driven targeting on conversion assists across several different categories, we teamed up with five Canadian brands, including CIBC and Porter, and four agencies: Amnet, Xpeto, Media Experts, and Mediacom. For some context, in our experiment 80% of all the conversions on average had an assist. The average path to conversion included 15 touch points, which translates to 14 assists. Conversion assists matter. Each campaign we tested included a split of non-data-driven targeting and data-driven targeting. The test ensured there was no overlap of users across lists, and we aggregated conversion uplift results from all five campaigns. The key metrics we used to measure the effectiveness of data-driven targeting were assisted-conversion rate and cost per assist. The results were again clear: Data-driven targeting outperformed standard demographic and geographic targeting on both counts, including a 36% median lift in assisted-conversion rate and a 47% median cost-per-assist savings. The results of our two experiments showed that running media programmatically can drive both upper- and mid-funnel brand and conversion uplifts. This was true for Canadian brands across several different categories and industries. 1. Consolidate data into a single platform so you have a view of the full user journey. 2. Execute as many media as possible programmatically so you can use data to optimize. 3. Measure for the full journey on all devices, including looking at conversion assists instead of just last-touch conversions. We no longer need to rely on the old formula of creative + media. The power of data + creative + media helps us take the guesswork out of our campaigns and deliver greater impact over time. With new insights into the whole customer journey, brands and marketers are rethinking campaign strategies and even how teams are structured. Take a look at some great campaigns that have been #InspiredByData.